Monday Morning Man: Michael B. Jordan! Coco Peru (aka Clinton Leupp) has just posted this on Facebook. I will say no more and let Coco/Clinton do the talking! Yesterday the Supreme Court debated DOMA and the day before, Proposition 8. Also yesterday, my partner of almost 18 years, Rafael, had surgery on his ear. Everything went well with his surgery but what I want to share is the importance of having the same rights in moments that matter. In light of the court proceedings in Washington, I hope that they decide on the side of equality so that all gay couples are protected by the law and have the same rights when, for example, taking care of their partner, as I did yesterday. To this end, I want to acknowledge the UC Irvine Medical Center and its staff for treating me and my husband as they would any straight couple who is married. When Rafael was prepped and waiting for surgery I was invited to come back and sit with him. The doctor, who did his surgery, Dr. Djalilian, came in the room to introduce himself to me. After the surgery, I was in the waiting room and the doctor came out to tell me everything had gone well and a few minutes later an announcement was made for Rafael’s “family member” to come back into the recovery room. Here I sat beside my husband while he was recovering from the anesthesia and held his hand, kissed and rubbed his head, fed him crackers, helped him drink water, answered for him when the nurse asked questions and he had trouble speaking, dressed him, and then brought him back to our home. On the day the Supreme Court debated our future, it meant so much to be treated equally, and I dare anyone to tell me how my relationship of 18 years and marriage of 6 years, a marriage based in love, respect, and commitment, is not equal to their own. Why is there even a debate? Bless you both in your relationship. So many heteros do not last a fraction of this time that you’ve been together. My sister-in-law has been married 3 times with 5 live ins in between. My niece has been married twice (both sham marriages. 1) To collect military benefits and 2) To give her “husband” a US green card and eventual citizenship. She has a child by another guy she never married. Meanwhile, a lovely couple of gents down my street have been a couple for 37 years before their marriage in Vermont 3 years ago. 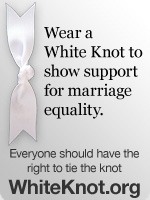 I support equality for everyone. I am so happy you were treated right! I graduated a year behind you & I am happy that you found your love! Yes, same school I support you!